It's the season for garden tours and I was reading about one that took place in my city a few weekends ago. One of the gardeners whose garden was going to be a part of the tour said something along the lines of "We like to have all the pretties, which is why we don't grow vegetables." That's not an exact quote, but close. The article is now in the archives of the newspaper so I'd have to pay to view it again, to get the precise wording. But that's a close enough paraphrase for you to see why I took umbrage with that statement. Great umbrage. Immediate umbrage. So much umbrage that I tried to register so I could leave a "nice" comment, but the registration site was not working at the time. Here's what I was going to put in the comment. "While flower gardens are beautiful, no doubt, a vegetable garden in mid summer can be just as pretty a garden as any flower garden." Really, even taking umbrage, that's all I was going to write. I was going to be nice about it because I'm sure I'd like the gardener if I met her. She is probably one of those gardeners with all shade who, because she can't grow vegetables, forgets how pretty a vegetable garden can be, how full of "pretties" it is. Here are some of the "pretties" in my vegetable garden today. 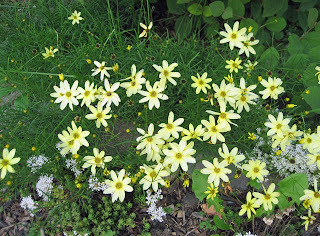 These Coreopsis 'Moonbeam' are at the entrance to the vegetable garden proper. They are pretty, aren't they? These tomato blossoms make me want my first tomato, right now, but it will still be a few weeks, at least, before I have a ripe tomato. They are pretty, aren't they? 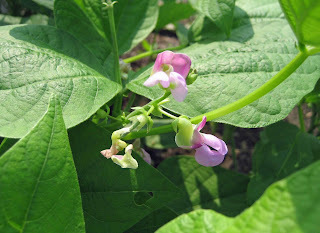 These green bean blooms are proof that I'm outsmarting the rabbits, finally, and they left the beans alone. They are pretty, aren't they? Not all green bean blooms are the same. 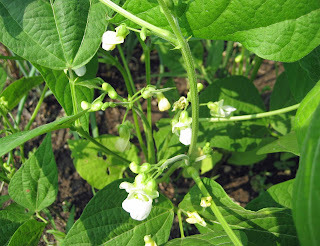 These white blooms are on my fancy French green beans, Haricot Vert. They are pretty, aren't they? Few flowers are as bright a gold as a squash blossom, and they are edible, too. They are pretty, aren't they? 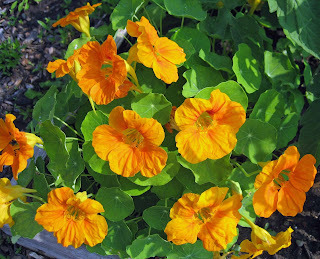 Around the base of most of the tomato plants, I planted nasturtiums. These blooms are edible, too. They are pretty, aren't they? I think event the compost piles have an "expectant beauty" to them, knowing this will be rich, dark compost over time. I won't ask you if you think these piles are pretty. 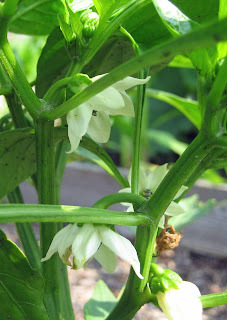 Yes, I think a vegetable garden can be a beautiful garden, full of "pretties", like those pepper blossoms in the first picture. The Vegetable Garden at May Dreams Gardens, full of "pretties" as the sun sets on Sunday, July 6th. Carol - you are right on with this post. Sure, flowers are pretty. But there is something so spectacular about kitchen gardens. I was so in love with the leaves from my last years watermelon plant. I think if I had to choose one or the other, I'd probably choose kitchen garden over flower garden. Thankfully, I don't have to. You are so correct, Carol. You've made a good case with your pretty flowers right in the midst of your vegetable garden. What is prettier than even the foliage of a healthy, growing vegetable plant? Not to mention the amazing fragrance of all those vegetable plants. All but one of my tomato plants is completely finished setting fruit. I'm still leaving them in the ground for a little while just to walk by and snap a leaf off once in a while for the yummy way it smells. Vegetable are beautiful. I'm growing two okra right now just because I like the flowers and they are one of the few things that can stand our heat. (I don't really like to eat okra.) Pepper plants are deep green and glossy...beautiful in the heat. Peas and beans are lovely vines. And Swiss chard...I planted that as an ornamental, too and then discovered how yummy it was. And colorful beds of salad greens...very pretty especially when done ind decorative rows or designs. And, of course, there's the herbs. For "A Midsummer Nights Dream", Shakespeare saw fit to name one of the fairies Peaseblossom - they're definitely pretty flowers, Carol, and so are your Beanblossoms and Squashblossoms. 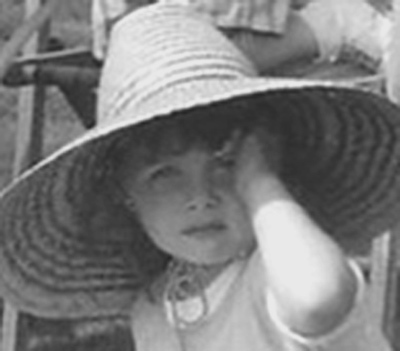 Who was the author of the garden tour article? Maybe she'd like a tour of the vegetable garden belonging to one of the most honored garden bloggers in the USA? And what about eggplant? It would be difficult to find a prettier plant than that! Your vegetable garden and all your veggie blooms are pretty Carol. I think the leaves on my cucumber plant are striking but then again I am a foliage person, and bonus it has several large orangish blooms just waiting to open. 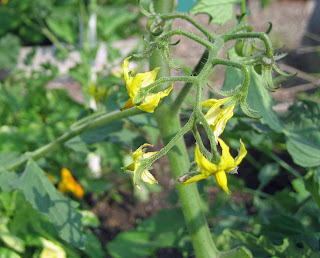 And the dainty little yellow blooms on a tomato are so sweet. 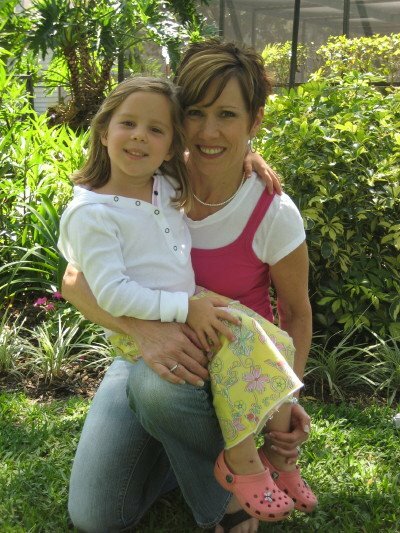 Carol, a true gardener, like you, sees the beauty of all plants. Pretties are your garden. I think you're right...sometimes a pretty garden is much, much prettier than a little ole' flower bed. That gardener didn't think about what they were saying. 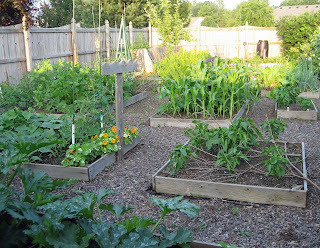 Of course vegetable gardens are beautiful and they give you something to nourish the body as well as the soul. Carol-All your posts are great but as I worked out in the garden this morning I couldn't stop thinking about the post and how it related to my garden. I may just post some thoughts on my blog later. With the cost of food I think the vegetable flowers are all 'pretty' promises of future food on the table without spending the green..there is nothing better than a ripe red tomoatoe, crunchy yellow corn, and snappy greenbeans, not to mention cabbage, peppers, okra, eggplant, potatoes, peas, onions...and the list goes on. But flowers on the table are nice too so leave room to grow some of them too and enjoy both. Love you raised bed garden! I'm hoping mine will look like that soon. You're right, I'm starting to mix veggies in with my "pretties" in my front flowerbed. I think veggies are even prettier when you're eating your delicious veggies! You can't bring one of your flowers in and keep it in the freezer to pull out in January to enjoy! Are you by any chance an attorney?You "pretty" much made a good case for veggies. And just think how pretty they will make your body, from the inside out! I hoe-heartedly agree with you. I love flowers but it's the possibility along with the flowers that make vegetables so beautiful to me. Oh Carol, I am with you! Nothing prettier than a nice, neat, healthy vegetable garden! I love seeing my vegetables growing all in their neat little rows! The blossoms are pretty, the deep greens are pretty...I could go on and on! I'm not into vegetables as much as I am my flowers, but I wouldn't want to be without them, and for sure, I like seeing them in so many different stages of growth. I think the gardener you're talking about is like someone who says they don't like cats and they've never had a cat for a pet. How do you know? If you've never allowed yourself the pleasure of having a cat as a pet, you'll never know how charming and loving they can be. If you've never raised vegetables, you don't know the joy they can bring and how beautiful they really are! Thank you all for the support! My umbrage has died down a bit, knowing that others believe as I do, that there is beauty, "pretties" in a vegetable garden. Thank you! Nice come-back, Carol. Excellent display of umbrage--and of vegie aesthetics. 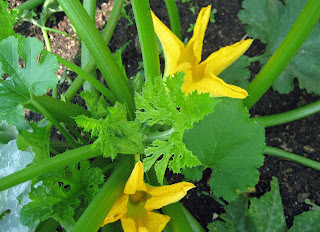 I was just oohing and ahhing over the veggie flowers in my garden this morning, as precious little else has seen fit to flower in our drought and heat - there's eggplant, soybeans, okra, eggplant, 2 kinds of cukes, chard, several squash varieties, and tomatoes in bloom as well as the beautiful cool ferns of the asparagus. Then I find my thoughts so eloquently expressed in your post and the follow up comments. What a delight to know you're all out there "speaking" for us. 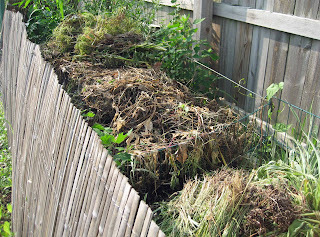 Well, your compost pile might not be "pretty" in the traditional sense, but I'm still envious!